As we had informed you at the beginning of the month (see post here), April was gonna be full of events for Pylon Network. During the past 10 days, our COO, Markos Romanos, went through an intense program of talks and presentations in 3 European countries: Berlin, Rennes and Belfast. Have a look below to learn more about the experiences and lessons we gathered on each stop of Pylon Network in April’s European tour. As Berlin as it could get! 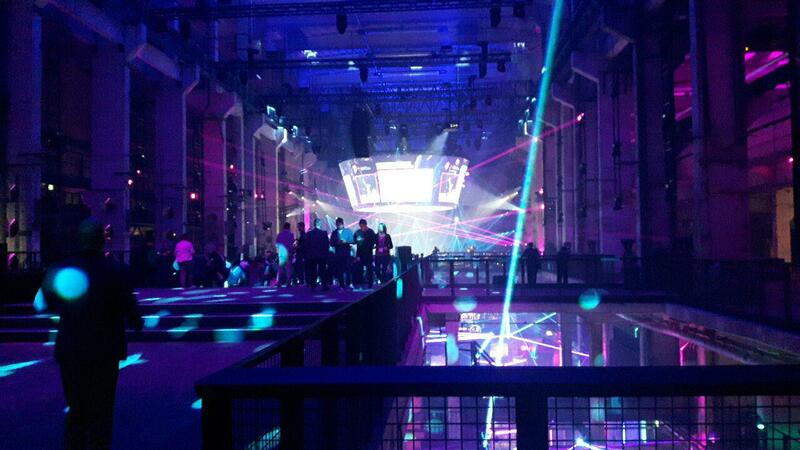 The event took place in an old power station, which has been turned into a night club (of course!). As one of the speakers proposed, this could be a great business opportunity for centralized power plants, soon-to-be commissioned! 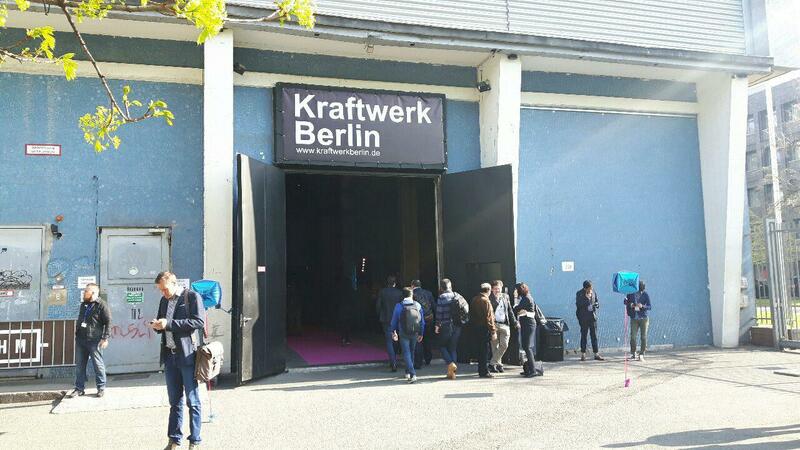 The 3-day event attracted the biggest players from the industry of energy, blockchain and academia (and all their inter-mingling). We attended on the 18th of April (see agenda here) and had the chance to participate in the presentations of the startups and in the deep dive sessions. It was a great opportunity for us to get a good overview of the development stage of other blockchain-energy projects from around the world. At the same time, Pylon Network was part of Ampere’s presentation, explaining how we are collaborating to apply blockchain in real energy applications through their innovative household battery solution (see more here). The CTO of Ampere (Xavier), presented and explained the simplicity and the innovative aspects of their all-in-one battery solutions for households. Blockchain was of course mentioned as part of their future development plans and Xavier explained the advantages of utilizing Pylon Network and why they have been working with us for its integration in their solution. Xavier mentioned the reasons why they got interested in Pylon Network among other blockchain solutions they have been experimenting with. The event was useful for us to get to network with many industry people who are exploring the intersection of blockchain and energy. It was also very to see the progress of other projects and understand the status of the sector. It was a general outcome – that was even discussed on public – that the blockchain sector has no good answers (or avoids giving them) to some of the big questions – the most common: real-world applications; quantification of the benefits. And this lack of real examples still acts as impediment on the technology being taken “seriously”. 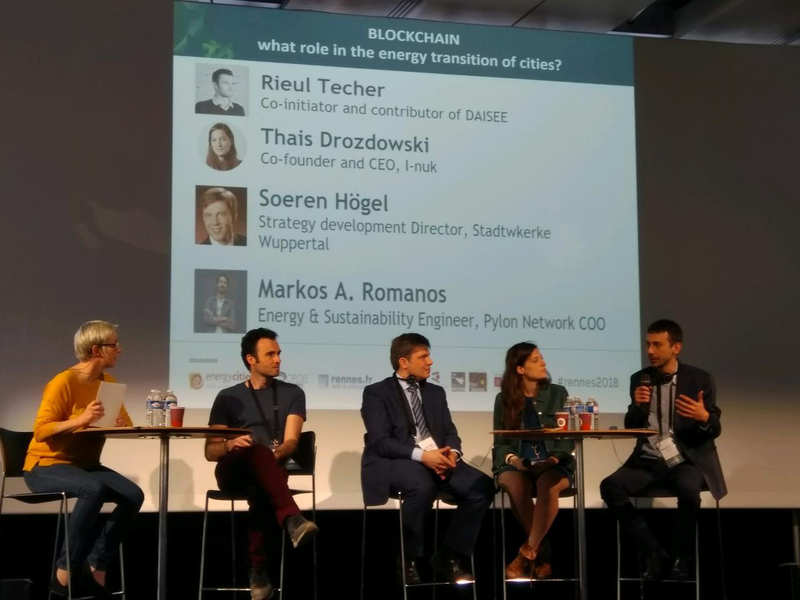 Energy Cities (Rennes): The role of blockchain in the energy transition of cities. We arrived just in time to listen to the very interesting talk presentation of the director of P2Pfoundation.net, Michel Bauens. He spoke about The Commons and the creation of value in local communities. He explained many theories behind it and described some examples communities engage in the creation of bottoms-up governance systems, from around Europe. He also highlighted the importance of open source platforms and he called for the need of a new way for “Commons Accounting” (“Multi-Capital Accounting”). Very interesting talk and we were lucky to have the chance and discuss more about the P2P platforms for the energy sector and the way that Pylon Network is looking at P2P models for the decentralization of the energy sector. As every year, the conference gathered stakeholders, ranging from local to national government officials, to NGOs and citizens movements to startups and projects that believe that our zero-carbon future is built through partnerships that are wide-ranging, both in scope and scale. These partnerships will have to be forged between all these actors (within territories, between urban and rural areas, between city administration and citizens, between national and local governments), so as to create truly local alliances. Cities and regions beautifully capture what the European Union needs to be more: democratic, sovereign and united. 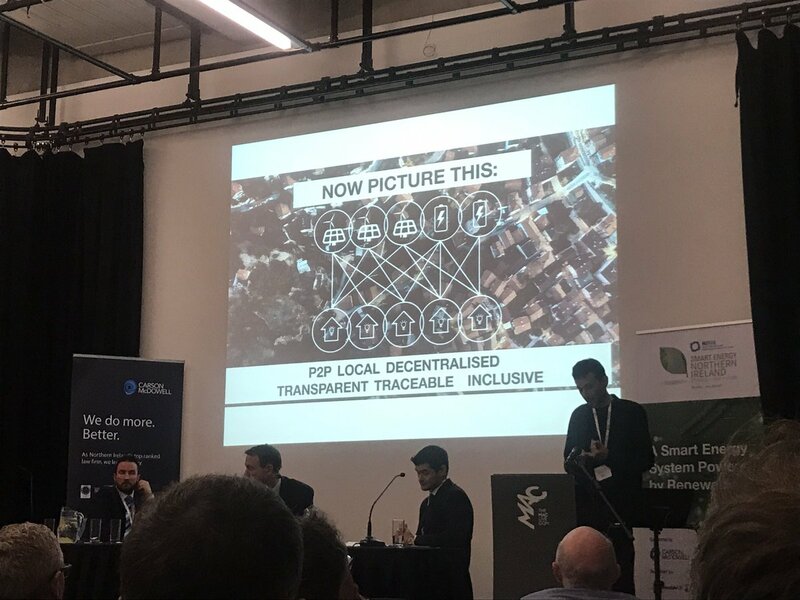 Exactly that, was the reason why Pylon Network was there and had the chance to participate on Friday 20 April, in a very interesting disussion, titled: “The role of blockchain in the energy transition of cities”. Our COO, Markos Romanos, participated in the panel, which included three more representatives from other European projects that are exploring different ways to induce the energy transition with the application of blockchain technology. The four projects: Daisee, i-nuk, Stadtwkerke Wuppertal and Pylon Network. The discussion begun with an introduction on blockchain and its capabilities, focusing on its possible applications on the energy sector. During the discussion, Markos had the chance to focus on the real implementation of Pylon Network with GoiEner, as part of the demonstration stage of Pylon Network. Focusing on the milestones we have already covered as well as the exciting ones to follow, the challenges ahead and how we are working to answer them. 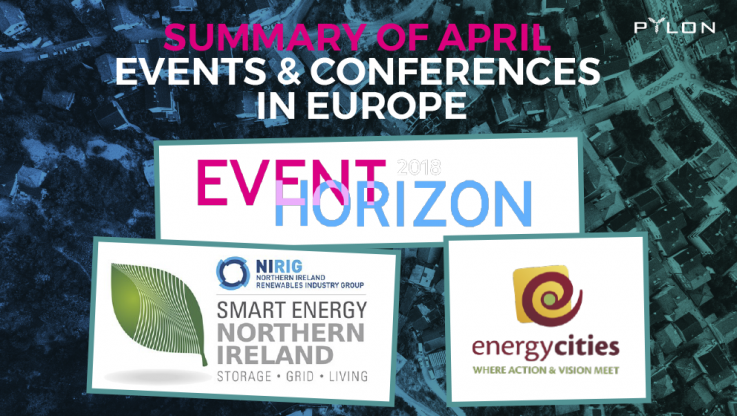 On Tuesday 24 April, NIRIG (North Ireland Renewables Industry Group) was organizing a half-day event, with focus on Smart Energy and Smart Grids. NIRIG launched a ‘Smart Energy’ programme of events to respond to the new challenges facing the energy industry. Smart Energy Northern Ireland 2018 brought together experts to discuss future energy systems and how innovative, forward-thinking organisations can become leaders in energy technology, management and trading – see all presentations here. Our COO, Markos Romanos, presented Pylon Network as part of the Smart Systems session and provided the audience with an overview of blockchain technology, its potential benefits and challenges from its marriage with the energy sector and the implementation of Pylon Network in a real environment as part of our pilot project with GoiEner. During the 20-minute presentation the focus was on the potential benefits for the grid and how Pylon Network unlocks the cooperation potential, though its open-source, collaborative blockchain algorithm, designed for the needs of the energy sector. The presentation raised a lot of interest and the feedback from all participants was very positive. We created a very good impression of the blockchain technology and our approach on applying it in a real-case scenario, introduced us to various opportunities and initiatives in N. Ireland that we are already examining with a lot of interest. With a full day completed, it was time for a cold Irish beer and a very interesting, friendly discussion with some participants to end the day in the best possible way – discussing politics and human nature of course! This was the end of an Odyssian trip, where we had the chance to meet new people, learn more about our sector, be introduced in new projects and market. Definitely, a full experience with many lessons to take home. Finally, we feel the obligation to say a big THANK YOU to all the great people who were involved in organizing, accommodating and attending these events. It was a great pleasure to be part of these events. If you want to make sure that you stay updated on the developments of the project, do not forget to subscribe to our monthly newsletter through our website. We also have many social accounts where you can follow us – see below.